thoughts of peace, and not of evil, to give you hope and a future. When you think of your own future, how do you feel? Are you excited to think of what is ahead or does the thought of the future cause you to be anxious? With an uncertain economy, wars and rumors of wars, etc., it is easy to feel anxious and uncertain about what lies ahead. 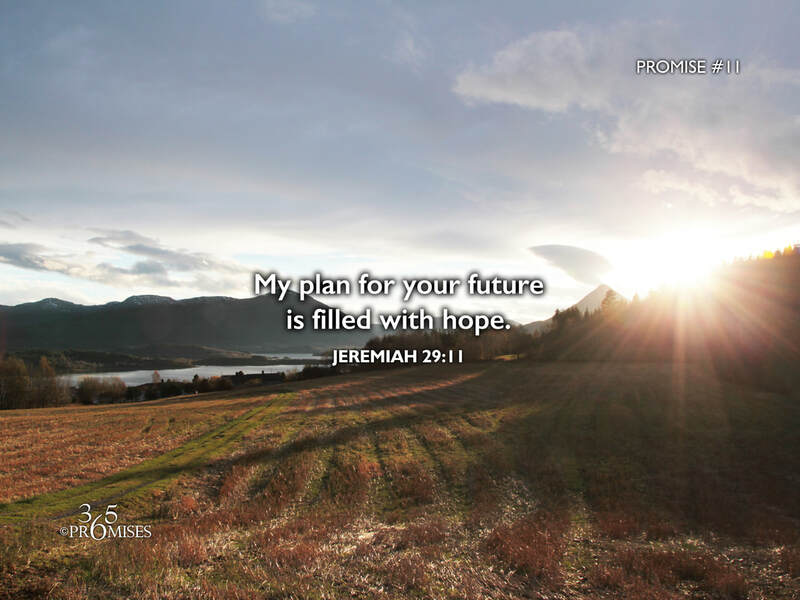 Yet in today's promise, God says that your future is filled with hope. I find it very reassuring to know that God has a plan for my future that is filled with hope. I don't have to dread what's coming because my Heavenly Dad already has a plan for me. And of course we know that the ultimate hope is living in the light of God's love forever! May the reality of today's promise fill you with peace. May you know that while the future may be uncertain to you, it is not to God. He has a father's heart toward you and has determined to fill your future with hope. Does this mean that there will be no bumps in the road? Certainly not.